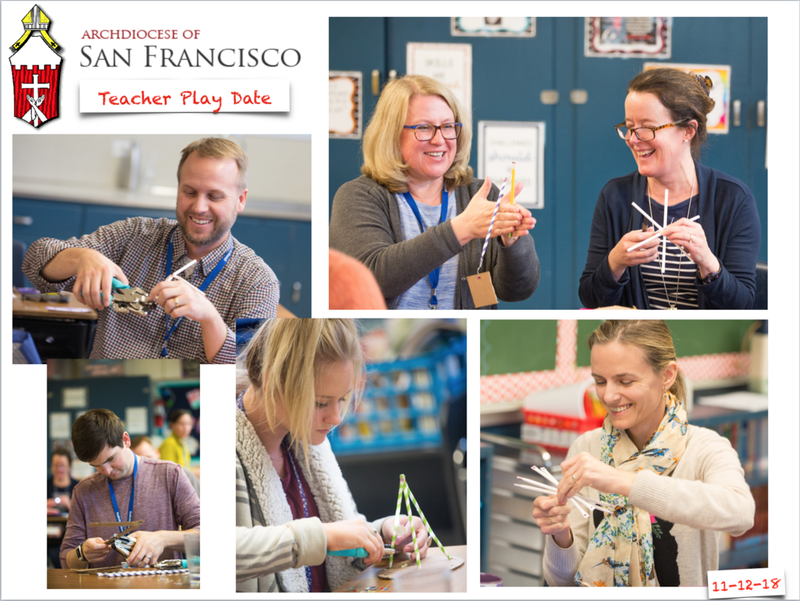 We are exploring an exciting idea in the San Francisco Archdiocese: the Teacher Play Date (PD). Teacher Play dates are rooted in the idea of kinesthetic tinkering. Nativity Elementary School in Menlo Park, CA was the first to host a Teacher Play Date for faculty. We worked with small grommet punches, needle nose pliers and paper straws to see what could be made. Kinesthetic tinkering is a powerful thing when picking up a new tool. We made bird feeders, Christmas trees, windmills and folding ladders amidst smiles and a contagious enthususim. The room just “felt right”. This Archdiocese program can serve as a PD model for other schools. We designed the program with a very unique structure. The person running the PD visits each school in advance to get a sense for what is already working on each campus and what faculty hopes to learn before designing the PD. This year the over all context is MAKE(ing) as in “God wants us to make the world a better place”. Find the verb in that last sentence. Make. Make means tools. Tools mean learning new skills. MAKE(ing) was the context of the Teacher Play Date yesterday, but each and every play date will look different within that context because each one is designed from scratch.